In the world of truck transportation, motor carriers are divided into two categories: for-hire and private. For-hire carriers, such as UPS, FedEx, Swift, J.B. Hunt, and Cowan are paid to carry cargo for other companies, whereas private carriers transport only their own cargo. Companies like PepsiCo, Wal-Mart, Giant, and Halliburton hire their own drivers to drive company-owned rigs, instead of paying a third-party contractor to haul their company's products. Although individual for-hire trucking companies are typically larger, with more trucks in their fleet and a greater amount of cargo than an individual private carrier, looking at the industry as a whole, private carriers actually ship slightly over half (51.7%) of all commodities in the United States. Four out of every five trucks in the nation belong to private carriers, and 56% of all American motor carriers are private. Incredibly, with such a large presence on the road, private carriers are only involved in 40% of truck crashes, whereas for-hire carriers are involved in 49%. Because private carriers typically treat their drivers better, with higher pay and greater benefits, it is possible that happier drivers are less likely to crash. But even with happier and more experienced employees, with so many trucks on the road, accidents are inevitable. In 2015 there were 415,000 police-reported crashes involving large trucks, 83,000 resulted in injury, and 3,598 were fatal. 166,415 of those crashes involved trucks from private fleets. The truth is that private motor carriers are under an enormous amount of pressure. Because for-hire carriers are only in the business of truck transportation, for-hire drivers can point to the revenue they generate with their truck to prove their value to the company. Private carriers, however, will always see their drivers as an expense. Truck transportation, for a company like Pepsi, is not part of their main profitability. 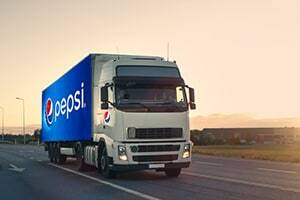 Pepsi makes its money by selling soft drinks, and although Pepsi needs trucks to transport their soft drinks to potential customers, the truck itself is a business expense. Therefore, Pepsi's drivers are under constant pressure to prove that they can do a better job than an outsourced for-hire company. As a result, private fleets are always measuring success, defining outcomes, and changing to become as efficient as possible. Sure, like any trucking company, private carriers have bad drivers who are prone to accidents. Sometimes, a private carrier like Pepsi will make a mistake in hiring a driver. But more often, private drivers are stressed by a system that demands speed and efficiency. At the end of the day, if a Pepsi driver causes an accident, then Pepsi is liable for the damage caused by their driver. Since most truck accident lawsuits include allegations of injuries and death, the core of these claims is that the real fault lies with the driver. Whether their employer is a for-hire carrier like UPS or a private carrier like Pepsi, the company is responsible for the pain, harms, and losses resulting from truck accidents. Since most car or truck accident cases do not involve a significant liability dispute, the real struggle is over the settlement value of the injuries. In theory, the identity of the defendant should make no difference to a jury, whose job is to determine the appropriate amount of money damages that would make the victim whole again. But in practice, the defendant does make a difference. Juries tend to feel empathetic toward individual people, and lawsuits against, say, a kindergarten teacher will tend to result in lesser jury awards. When suing a large company like Pepsi, however, fewer jurors will feel sympathetic toward the defendant. Consequently, the trial value of a personal injury claim will usually be higher with large companies like Pepsi, and this higher trial value results in a greater settlement value. Larger settlement value can also result from the relative size of a rig. Because tractor-trailers are bigger and heavier than passenger cars, they can cause more damage. Claims adjustors for both private and for-hire motor carriers are accustomed to dealing with larger dollar amounts, which tends to have a productive impact on settlement value. What Else is Different About Claims Against a Private Carrier? Lawyers who regularly handle car accident cases are not always qualified to handle truck accident cases. Tractor-trailers are often equipped with certain accident-related data storage devices, requiring attorneys to have a specialized knowledge of these cases. Many cargo transport vehicles carry modern electronic sensors that can store information about speed, airbag deployment, braking, and many other data points that can help determine whether the truck driver was at fault for the crash. There are also many state and federal regulations that are different for private motor carriers than for-hire. Not just any car accident lawyers can navigate this tangle of data and regulation, but there is an arsenal of tools available to help victims if you know where they are and how to use them. Our website has a host of tools designed to aid victims in understanding the possible settlement value of their claims. The most predictive measure is the settlement value for the same type of injury, but it may also be helpful to also look at the type of accident. For both of these variables, we provide statistics for the average trial or settlement value. Although limited in their application to new cases, samples of settlements and verdicts involving the same defendant may be worth a look. In very general and limited terms, these statistics will give you a sense of how settlement values can change based on the severity of injuries, the economic loss caused by injury or death, and jurisdiction. 2016, Oregon, $4,386,817 Verdict. A Walgreen Oshkosh tractor-trailer struck the left rear corner of the plaintiff's vehicle while attempting to change lanes on an interstate. The plaintiff, a 37-year-old male, suffered traumatic carpal tunnel syndrome requiring surgery in his right wrist, lumbar radiculopathy requiring injections and surgery, and cervical radiculopathy requiring injections. The jury awarded the plaintiff $134,747 in past medical expenses, $18,000 in future medical expenses, $206,000 in lost wages, $3,385,240 in impaired earning capacity, $25,000 for vocational rehabilitation expenses, $67,830 in substitute household services, and $550,000 in non-economic damages. 2015, Minnesota, $4,080,000 Verdict. The adult male plaintiff was forced to brake and crash his motorcycle to avoid a vehicle collision with a Sysco Asian Foods tractor-trailer. The tractor-trailer drove into a left-turn-only lane and then attempted a right turn across the plaintiff's path of travel. The plaintiff suffered brain damage, partial hearing loss, skull, tibial plateau, and multiple rib fractures, subdural hematoma, and emotional stress. The jury found both the plaintiff and the defendant were negligent, with 65% fault apportioned to the defendant for failing to yield the right-of-way, making an illegal lane change, and failing to keep a proper lookout, and 35% fault apportioned to the plaintiff for a negligent attempt to pass and failure to wear a helmet. The plaintiff was awarded an amount of $4,080,000 that included $230,000 to the plaintiff's spouse for loss of consortium damages. 2015, California, $11,876,656 Verdict. The 41-year-old female plaintiff was driving on the highway when a corner iron securing a load of empty crates on one of defendant Lion Raisins' tractor-trailers came loose and went through the plaintiff's windshield, hitting her in the right head and skull. The plaintiff sustained a bone-penetrating brain injury, along with multiple areas of bleed and a documented diffuse axonal brain injury. She suffered a Glasgow Coma scale of three, neurosurgery, multiple seizures. As a result she had to retire early from her job as a teacher. 2012, California, $5,102,000 Settlement. The primary plaintiffs' teenage son was a passenger in a car driving on a highway when a Costco Wholesale tractor-trailer driver made an illegal U-turn in front of the plaintiffs' vehicle. The resulting collision caused fatal injuries to the primary plaintiff's son and the driver of the vehicle, and an additional passenger was severely injured. The plaintiffs settled with the estate of the host driver for $100,000 in insurance policy limits and $2,000 in funeral expenses. Then plaintiffs then settled with Costco Wholesale for a lump sum of $5,000,000 which was split with another passenger in the car and the estate of the host driver. 2010, California, $6,445,550 Verdict. A defendant Land O'Lakes tractor-trailer turned left in front of the plaintiff's motorcycle and crashed head-on with the plaintiff. The 56-year-old male plaintiff suffered from multiple broken bones and fractures, including a broken left femur, and continues to suffer from his debilitating injuries and chronic pain syndrome. The plaintiff could never return to work as a correctional officer or ride a motorcycle again. 2008, Illinois, $2,800,000 Settlement. A 22-year-old female college student died of burn injuries after her vehicle, stopped in traffic, was struck from the rear by a Jewel Food Stores tractor-trailer that failed to stop in time. Her vehicle was crushed between the Jewel Food Stores tractor-trailer and the cement truck stopped in front of her. The plaintiffs alleged damages for their daughter's wrongful death. 2006, Ohio, $7,028,687 Verdict. A 22-year-old male died when a Tyson Foods tractor-trailer crossed the center line of a rural two-lane roadway, colliding with his vehicle head-on. The deceased's parents were awarded $1 million for their loss of services claim, in addition to $6,000,000 for pain and suffering, $22,000 for property damage, and $6687 for funeral expenses. Our law firm is based in Maryland. Most of the truck collision cases we handle are in the Baltimore-Washington area, but we handle significant injury cases throughout the entire country. If you have been harmed in an accident with a truck and want to consider a lawsuit or a claim for an out-of-court settlement, call one of our lawyers at 800-553-8082 or get a free no obligation Internet consultation.